The speaker, Cheryl Phippen, is an entomologist with an RN degree. “It’s a perfect fit”, she says of her complementary scientific background. Cheryl is co-owner with her husband Burke Phippen of BWP Consulting, a firm specializing in water quality analysis and mosquito control. Water quality is in Burke’s hands. Mosquito control is Cheryl’s responsibility. 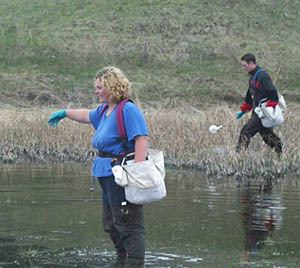 Since 1999 she and her crews have mapped, tested, monitored, advised and carried out mosquito control in the interior of B.C., including the Cariboo, West Kootenays, South, Central, and North Okanagan, and the Thompson Nicola Regional District, centered on Kamloops.. Their tasks vary depending on the wishes of the municipality or Regional District. Their focus is two-fold: to control both the aggressive ‘nuisance’ mosquitoes, and to carefully monitor for any signs that the West Nile virus has spread to B.C. The West Nile virus arrived in New York, a port city, in 1999. It was probably transported by a human, since it had previously been known in Europe and Africa. At first health authorities assumed it was the St. Louis virus, which is endemic in the southern U.S. Then they thought it might be the Western Equine Virus, already known in North America. Word began to spread about deaths of crows and other corvidae. There were several human death. Not until the fall of 1999 did authorities realize they had a new virus. They weren’t sure it would survive the winter, but it did. In 2000 West Nile spread to the maritime U.S. In 2003 it hit the prairies in both Canada and the U.S. Crows and their relatives, ravens, magpies, and jays, began dying in noticeable numbers. There were more human deaths. And horse owners began to worry. Other than crows, horses are most affected by the West Nile virus. Forty percent of all horses which get West Nile die. (Only one percent of affected humans die.) Fortunately there’s a vaccine for horses, though there isn’t, yet, for humans. “There’s a lot less testing required for equine vaccine” notes Cheryl. That vaccine is recommended for all horses in B.C. So far West Nile hasn’t been detected in B.C. and the Provincial Government wants to keep it that way. Though there have been a couple of dozen human cases in B.C, they were all travel-related. None were acquired locally. B.C. is the only jurisdiction that has done preventative work. Unlike other jurisdictions, which waited till the virus had arrived to take action, B.C. has already set up a program of trapping, testing, mapping, controlling and public education. Cheryl and BWP Consulting are involved at all levels. Previously there wasn’t a lot of research involved in mosquito control. “Just kill them when they’re biting..” That’s changed. B.C.’s pre-emptive research puts it ahead of the pack in responding to other insect threats driven by climate change. The assumption is that West Nile won’t be the only virus moving north. “We have the mosquitoes capable of transmitting malaria; we just don’t yet have malaria.” Cheryl warns. There are forty species of mosquitoes in B.C. Only a few of them are actually capable of transmitting a virus. Most species take only one blood meal in their lives. After mating, the females take a blood meal, develop their eggs, lay the eggs in a damp area, then die. These mosquitoes are very aggressive biters, the ‘nuisance’ mosquitoes. They all hatch at once and, because they’re short-lived have to mate, eat, and lay eggs before dying. They’re annoying, but, because they have only one blood meal, they can’t transmit West Nile. Culex tarsalis is a very different matter. The females over-winter and come out during warm periods. They’re the first mosquitoes seen flitting about. They eat and lay eggs several times. In spring they take their first blood meal, then lay eggs, then take another blood meal, then lay another batch of eggs. The hotter the summer, the higher the risk because Cx tarsalis lays more batches of eggs in hot weather. It’s not an aggressive mosquito. Because they’re not very visible people don’t tend to notice them and take precautions. The biggest outbreaks of West Nile as it’s moved across the country are in August and September. To be fair, Cx. tarsalis prefers to bite birds. The cycle of virus transmission is usually, bird-mosquito-bird. Once in a while a mosquito bites a human or a horse. Which is bad news for the virus, because that’s the end of the line. The virus can’t be passed human to human or horse to horse by a mosquito. Mosquitoes can only get the virus directly from a bird. This cuts down the number of species in B.C. which may transmit West Nile because only a very few bite both birds and humans or birds and horses plus lay multiple batches of eggs. Some other species only spread West Nile bird to bird. They only bite birds and will not bite a human or a horse. What can you do? Well, it’s not so hard. Wear long pants and long sleeved shirts at dusk and dawn. Make sure door and window screens on your house, tent or camper have no holes. Keep moving. “If you’re outside, it’s better to be active than to sit around being a mosquito meal.” Cheryl laughs. Use insect repellant; those containing DEET work best and longest. Old tires make excellent habitat for mosquitoes. Cut holes in them so water will drain, or call the tire recycling program. Cut weeds and long grass around your house. No need to go overboard, though. The person who called Cheryl to cheerfully report that he was cutting the bushes along the river bank had to be gently reminded that that was an important riparian zone. Damaging a riparian zone is frowned upon. In ecology everything is connected. Consultation with land owners is very important to the success of the program. Cheryl’s crew of eighteen to twenty employees gets permission from all property owners before going on their land for any purpose. For Cheryl, who began mosquito control in 1999, her career is an exciting challenge combining scientific analysis, public education and planning for the future. In the first year she revamped the mosquito control program in the TNRD. Formerly it had relied heavily on malathion, a chemical pesticide. Malathion is now a last resort, in fact it hasn’t been used in the TNRD in five years. Instead, BWP Consulting relies upon Bacillus thuringiensis, var. israelensis. Bt. is certified as safe for organic gardens. It is safe for all insects except mosquitoes and black flies. When treating a site the bacteria are attached to corn as a harmless, effective carrier. Delivery can involve anything from hand spreading, (“Like feeding the chickens” Cheryl remarks), to back-pack blowers, and helicopters, depending on the extent and accessibility of the area. In the TNRD there are over four hundred known breeding sites for both nuisance and West Nile mosquitoes. The first step is to confirm that larvae are present. “The compound is too expensive to waste. We confirm the pests are present, treat the area, then go back to make sure it worked.” It only works if the larvae are present. Depending on the hatch, they may have to treat an area several times. In some localities Cheryl tries to leave the larvae in the eco-system as long as possible so that predators such as trout can eat them. As part of its public education BWP Consulting has done TV spots, and had booths at events including farmer’s markets and fall fairs. In small towns they set up by the post office. “Everybody comes to the post office”. They will do special presentations to groups who ask. They’re flexible and can go from ten minute presentations to full day workshops. To contact them directly, call 250-573-1750 or e-mail bwp@shaw.ca. scientific education and connecting with researchers around the world is vital. Cheryl has twice gone to the University of Florida for two weeks of mosquito identification, including other disease vectors. A more timely conference, the North West Mosquito Control Association meets in October, drawing delegates mostly from the western States and Canada.